1981, Fall Semester, Nursing 201, was the introductory class in our nursing program. The words, “Fools Rush In Where Angels Fear To Tread” were written on the blackboard. The phrase was new to me. I thought it scripture, but later learned it was a line of poetry by Alexander Pope, written in 1709. His poem, An essay on criticism, was targeting literary critics of his day. The semester introduced the historical aspects of the nursing, but more importantly it explored the personal and psychological aspects of the profession into which we were embarking. It was a class of introspection prior to beginning clinical practicums. We were taught to see ourselves and our biases before entering into clinical situations. Nursing, like ministering provides individuals with access to personal situations experienced by others. The relationships can be short or long term. Some are easy, natural and non-stressful. Occasionally we are privy to deeply troubling circumstances, or serious illness, or private heartache. One of the major differences between nursing and ministering is documenting and reporting. As a nurse one must document the encounters…the assessment findings, the education, care, medication and/or treatment provided, and finally the response to interventions. In today’s age of electronic records, all members of the health care team have access to each other’s notes as a way to improve the quality of healthcare. To my knowledge, with ministering, the only documentation, is a quarterly record of the number of ministers interviewed. There are no records of our ministering assessments or interventions. Thank goodness for that. No one would want a record floating around with details of individual people’s circumstances. I wonder how one learns what or how to report, especially as a new member or a YW, turned RS-member. We can help each other in this respect, by establishing ground rules or ministering-orientation. I know the last thing anyone wants right now is more lessons on ministering; we had so many in the last year. In my memory they have been well intentioned and generic; mainly focused on how to ‘reach’ someone and the various ways to minister, be it phone calls, texts, emails, or in-person visits. I don’t recall a specific lesson on what to report or not report, or how to establish those ground rules with the person you minister to. That being said, I did miss quite a few meetings last year and perhaps it was covered. In the Nursing 201 class we were encouraged, through a series of thoughtful discussions, to see beyond our own beliefs, values, religion, culture, race, education and gender. We were asked to see our future patients with open eyes and a caring posture regardless of whether we agreed with their life decisions or not. That certainly applies to ministering as well. Learning how to minister within our family and wards prepares us to minister in the broader sense to anyone we might encounter in our life’s path. We had a lovely discussion in our RS recently about ministering based on the talk by Sister Cordon in October 2018 General Conference. Being able to ‘see’ people beyond their activity level at church, or their lifestyle choices opens the door of our hearts. Fools rush in where angels fear to tread is an idiom I have reflected on since college. The expression refers to foolish or naive people doing things that a more mature person might avoid. I have wondered if I rushed in to situations where I should have stayed respectfully on the outside. Part of growing up involves knowing when to intervene and when to stay out of it. I recall a perfect storm situation when I was serving as RS President and a member of my ward was having a serious health problem. Always a nurse, I pushed in and was gently rebuffed, only to be invited in with open arms a few weeks later. Maybe my timing was off. Regardless, I know for sure that I was in the right calling at the right time in order to help this family. As a new blogger at The Exponent, I feel a large measure of naivety considering the many years and experiences of others that have brought us to this moment. I enjoy this forum for discussion, illumination, commiseration, and education. Perhaps a new idiom is in order, although I can’t think of an improvement on Charity Never Faileth. 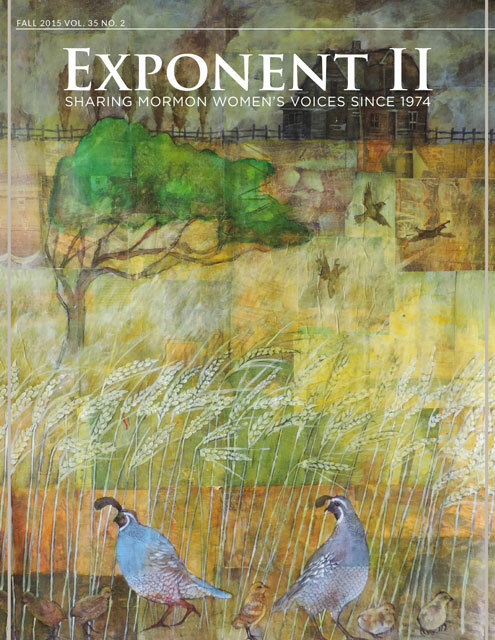 Having charity for each other, in this space, is what The Exponent is about. Have you struggled to know if you should ‘rush into’ a situation, for better or worse? In what ways were you taught how to report or what to report? How do you maintain confidences during ministering interviews? September Young Women Lesson: How can I be in the world but not of the world? Great post new perma!!! I struggled with reporting when I was in the RS presidency with our new interviews. I kept meticulous records of the interviews, but there didn’t seem to be much use to it other than my own continuity to follow up in the next interview with the issues. After I was released I threw away the files on my computer and that was that. I’ve wondered/worried about what my ministering sisters might say about me. Now I have one who I trust implicitly. She has helped me enormously, and I know she would never betray a confidence. Welcome, Allemande Left! I love this idea of taking your work experience to help fulfill one’s calling. I often think how ministering work, like teaching, nursing, counseling, can help us as we do our callings, and we can learn from each other when a ward has lots of people in different careers. I keep thinking back on this post. Thank you for sharing. I really loved the way you talked about ministering, and your openness to the feelings and expertise and experiences of others. Treating others with gentleness and practicing principles of compassion and good judgment (e.g., keeping information private, showing the person you will keep things private) is really important. So glad you’re here (insert many heart emojis).